Thanks to everyone who made the diskant party a success – you all rock! In celebration of our ten year anniversary, we put together a limited edition zine with 32 pages of writing on bands, records, festivals, films, gaming, politics, tv and books from the diskant team over the last ten years. You can buy a copy for just £1 right here. There are also diskant badge sets for extra fun. 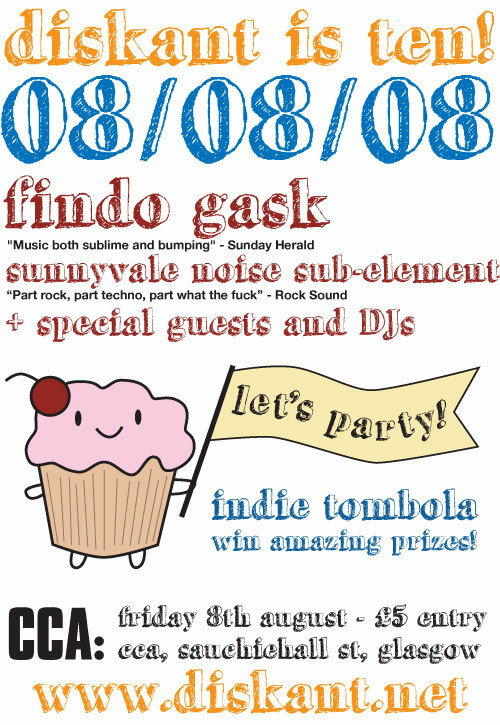 Our celebratory party took place at the CCA in Glasgow on 08/08/08 with FINDO GASK and SUNNYVALE NOISE SUB-ELEMENT. We also had an indie tombola where many happy people won amazing prizes from Rock Action, Blood Red Shoes, Gringo Records, Unpopular Records, Miso Funky, Sailors, Highpoint Lowlife, Asking For Trouble, Sunnyvale Noise Sub-element, t-boo, I Like, JGram and a few more. Read more about them here. TEN YEARS OLD, you say? Yes, diskant was launched back in 1998 by Marceline Smith armed with a free hosting account, a car boot sale computer and a state-of-the-art 56K modem. Initially providing an online version of her print fanzines, it grew to a community of websites by independent zines, bands and labels. During our glory days, diskant hosted the Mogwai fansite Brightlight and worked with the BBC and Channel 4. Things have downsized these days for our own sanity and diskant now runs as a webzine, posting interviews, reviews, round-ups and nonsense about all our favourite bands, films and events. Firmly based in Glasgow, we’ve always kept our distance from the London music scene to do things our way and promote our local areas. Our writers are mainly based in Glasgow, Nottingham and Oxford. Our writers have included Wil Forbis (author of ‘Acid Logic: a decade of humorous writing on pop culture, trash cinema and rebel music’), Conrad Keely (of …And You Will Know Us By The Trail of Dead), Stewart Smith (Beard zine) and Chris Summerlin (of the bands Lords and Wolves of Greece!). Over the last ten years we’ve interviewed everyone from established artists like Mogwai, Fugazi, Zoot Horn Rollo (The Magic Band), Ash, The Strokes, Explosions in the Sky and Foetus to the brightest new talents well before they hit the big time, such as The Young Knives, Foals, Battles, Gay Against You and Youthmovies. We may be getting old but we’re still dedicated to writing about new independent music and highlighting the best new bands in the UK. We hope you’ll help us celebrate!